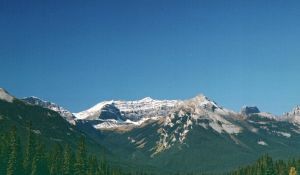 This peak is #59 in Prominence List for Alberta .Located 20 km west of Banff, south of Redearth creek, in the same group as Mount Borgeau. To the west is Lost Horse Creek. A rocky peak with no glaciers, easy to climb from the west via Lost Horse Creek. Name Notes: It was named in 1916 after the Honourable Robert George Brett who during 1886 was assigned to the many CPR contruction projects. He eventually became the Lieutenant Governor of Alberta.